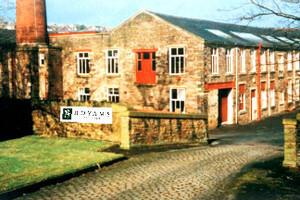 A family business established in 1980, Royams manufacture a range of Fireside Chairs, Manual and Powered Recliners as well as Lift & Rise Recliner Chairs. Recliners and lift & rise recliners are available with a heated lumbar and massage system as an optional extra. Recognising the need for various types of seating as a person’s size, weight and height differs, as well as their mobility, Royams offer a variety of seating sizes and mechanical assistance chairs. Maintaining excellence, both in quality and craftsmanship, every Royams' recliner and chair is made to order, wherever possible offering a variety of seat heights, seat depths and seat widths. Using only the finest materials, every chair is hand finished before going through stringent quality control testing. 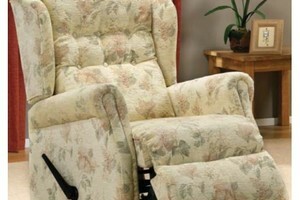 For added peace of mind Royams also provides a 5 year warranty on all reclining, electrical & mechanical components. 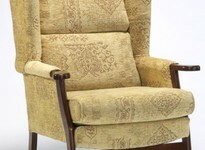 The Royams range of fixed chairs and recliners also come in a range of fabrics, leather and vinyl coverings. The Royams collection of recliners and fireside chairs is now available to buy at Dalzell's of Markethill. What's more, if a Recliner Chair has been recommended to you or a family member for health reasons, and you live in Northern Ireland, request a letter from your Doctor and we’ll Zero Rate the Vat on your purchase! Yes, you will not need to pay the 20% VAT! The Royams Cambridge Fireside Chair is a traditional style fireside chair with a high back and high seat. Available in a wide selection of fabrics, this fixed chair also comes in a choice of six wood frame colours. 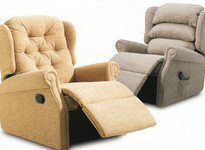 The Royams Francesca Handle Recliner is part of the brand's manual recliner range. Featuring wing styling with wood trim, this recliner comes with deep buttoned back cushions. This model also benefits from a comprehensive choice of fabric covers to choose from and there six different wood colour options for the knuckle arm and trim. As well as being available as a manual recliner, the Royams Francesca is also offered as a fixed chair, electric power recliner, single motor lift & rise recliner and dual motor lift & rise recliner. The Royams Tara Mono Tilt In Space Recliner is a Neat and Compact Design with a Chaise Style Seat for additional support and a Luxurious Deep Buttoned Back for extra comfort. The Ergonomically Designed Handset releases the footrest, and on a TIS recliner, causes the base to move in harmony with the back. Which means once the foot rest is partially elevated, the Revolutionary TIS (Tilt in Space) Action will Recline the Back and the Whole Chair Tilts on its Own Axis, causing nil sheer factor on the back when reclining. The Royams Donna Dual Rise & Recline Chair is part of the Royams Donna Collection of Recliner Chairs, which was awarded the coveted 'Which? Best Buy Award 2014' for Riser Recliner Chairs. The award is based on: comfort, feeling secure, ease-of-use, speed of operation and back-up battery. An Exceptionally Comfortable Design, this powered recliner chair features a Tiered-cushioned 'Waterfall' Back, Exposed Dark Wooden Knuckles for easier hand grip, and Chaise Style Seating to provide extra support to your legs when reclined. At Dalzell's of Markethill we retail a large selection of Royams Fireside Chairs and Recliners which benefit from a personal 5 year guarantee. Available in a choice of fabric or leather finishes, you can browse the collection from the comfort of your home via our ecommerce website ArmaghBeds.com where you'll find the full suite of Royams Manual, Powered and Lift & Rise Recliner Chairs. What's more, if a Lift & Rise Recliner Chair been recommended to you or a family member for health reasons, and you live in Northern Ireland, request a letter from your Doctor and we’ll Zero Rate The Vat on your purchase! Yes, you will not need to pay the 20% VAT! If you live in the rest of Ireland and you're in the market for a new upholstered or leather Adjustable Chair, don't worry, as we love to strike a deal. And with Free Delivery throughout our Free Delivery Zone - Northern Ireland and Counties Monaghan, Louth and Dublin - there's never been a better time to invest in a new recliner.